Faced with the frustration of landings where the Sentry Gun was unusable due to landing conditions, I decided that a version with limited rockets was the solution. - Troubleshoot problems with installing OpenXcom or Mods and where to find help. Navigation Links on the right side will allow you to skip to sections of interest in the video. (In order to move to the new integrated commendations mod, you must clear out previous medals. With the new inclusion of Soldier's Diaries in Meridian's latest build (Jul 05, 2016) we are now at the point we can seriously consider/work on a Commendations Mod for Piratez. There has been some initial work done by DracoGriffin as well as some brainstorming in the main Soldier Diaries thread. I'll try to capture those items here to continue the discussions. - most of the latter pages of the thread are bug fixes/reports here or there. - Commendations was written for Vanilla XCOM UFO, and as such features only those races/ranks/weapons/damagetypes in criteria, etc. - DracoGriffin has done an initial re-write of names of ribbons and descriptions to be more Piratey. Replacing the vanilla ribbons with more piratey bling, eg, tattoos, or jewelry pieces. - This would most likely require re-coding how the graphics are displayed, and would need Meridian or Shoes, or some other willing soul to lend a hand. I would recommend a hard look at the amount of awards with an eye to reducing bloat. Also: Is this Commendations integration something that Dioxine wants to handle without collaboration? Obviously, anyone can make their own mod for XPirateZ, as I did with the initial Ufopedia mod for Commendations back in the day. But if Dioxine wants direct control over this, then maybe it makes sense to only provide support where he'd desire it. It's true that making proper award graphics for everything will be quite a lot of work though.. But since pirates don't do medals, maybe there can be something easier. Like the Iconoclast award (for killing 1 of every church rank? Or X number of church people?) could just be a picture of a smashed up church, or, as a placeholder, just show the corpse of a church cardinal. This way, Dioxine's ability to find awesome pics can come to the rescue, instead of finely crafting military style medals. I'm attaching a version of Draco's .zip, with a couple bug fixes, a bit of annotation, and some languages removed (all but En-US, the official XPirateZ lang). Edit: updated the package with fixes to get it to work with PirateZ as master. After practically developing carpal tunnel from all of the clicking involved with manufacturing Battle Tank (Craft) for sale, I thought "There has to be a better way..."
Repeat above steps until out of Plasta-Steel (I bought in lots of 1000 to make 4 tanks before purchasing again). Buy plastasteel. Add in previous steps. Repeat. So I started brainstorming about how to "automate" this process a bit more. I hit upon the idea that we could wrangle a Guild Rep into "running" the business for us, and just put it on auto pilot (make infinite, sell all). Of course this wouldn't be completely painless so I added a 10% "management fee" to the cost of production, but this would be well worth saving the seemingly infinite clicking. Presents a new research topic called Defense Contract. This depends on Privatizing World Peace and the interrogation of a Broken Traders Guild Rep. Costs are minor for the topic, and once researched allows for the production of "Defense Contracting" in the "Merchandise" section. 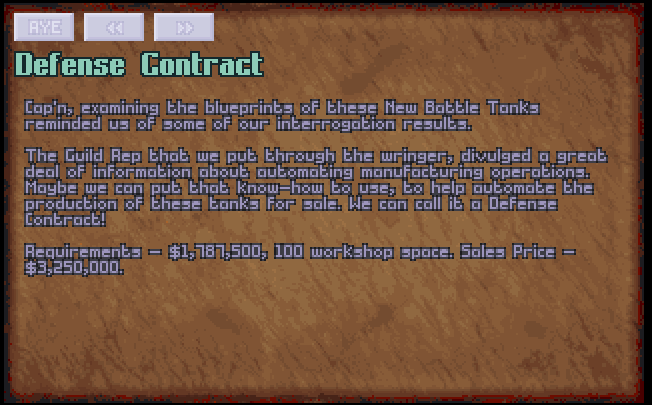 $2,557,500, 100 workshop space, and 10000 hours will produce one "Filled Defense Contract" ( Sales Price - $4,000,000" ). (With my factory base of 410 Runts cranking away, this is showing an upfront profit of $42.5 million/month before salaries and overhead). This is strictly designed to make the endgame burden a bit easier by minimizing a bit of the grindi-ness. Edit: Updated for Piratez .99.e.3 ( to include Armory requirement and also adds in a slight cost for workers to simulate space in the vaults for the Plastasteel). XPiratez / How to build the Conqueror? ....cause holy hell the building components for the conqueror. This thing is gona need an entire dedicated base just to assemble. Would you consider developing idea this further, that we can get a Conqueror Manufacturing base design up on the wiki? Feel free to post in the bootypedia thread, or start a new one. New with 98C is a terryifing, mind-boggling, and possibly incredibly lucrative new mission called the Mansion Invasion. In the interests of Science (and to create substance for the Bootypedia Article) and the glory of impressive war stories, I'd like to hear some reports from any that have tackled these nightmares. 6. Other notes, i.e. effective armors, tactics, etc. I'm looking forward to these tales of pain and glory!! There are rich mansions around the world, waiting to be robbed! Yet them defenses are too strong for a frontal assault. We need to go sneaky by dressing up as servants, and then escape from the roof. Therefore only maid, nurse, dress, thieving, and highly magical outfits are allowed. If we send gals who are wearing something else, we'll scrounge up some maid outfits for them inside the mansion. Also only Infiltration-type items can be sneaked inside. For getaway, we need a fast enough and not too heavy a ship. Speaking of which, when preparing your vessel, better not to bring to the mansion anything the gals won't carry in their inventory, who knows where that extra stuff is going to end. Our informers will get onto gathering data and when they'll locate a suitable target, you'll be alerted, Cap'n! "This place be holdin' many treasure! We will launch a sneaky attack. Any non-Infiltration equipment we're carrying will be sent to the Hideout now. To abort and escape, go to the extraction zones on the roof (all of them will be immediately visible). Otherwise defeat them all, but this can take a lot of time!" 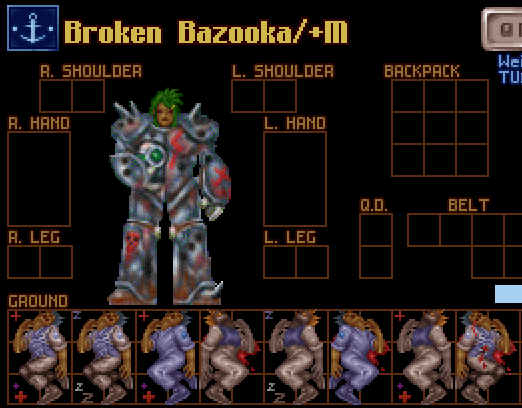 description: "Provides an updated battlesprite of the original Damaged Defender armor (Defender Minus) to bring it more in line with the Inventory image." using the same sprites as the better armor. to be easier than I thought to merge the Dragonfly and Defender armor. This mod will cease to be useful if Dioxine adopts these sprites for the main mod. Edit: Forgot to attach the .zip initially. There you go. Also, this isn't tested. Please report any issues here. Thanks! The learning curve from OXC to XPirateZ is steep! Trying to figure out how to get the best out of your gals, (especially in the early game) added to the huge variety of weapon types, can make your brain burn. I tried setting up some spreadsheets to help me calculate which weapons benefited which gals the most. I found this most useful for melee weapons because they stats they use can be so varied (bravery, reactions, melee, etc). Then I got in touch with Imeryak to ask him for help pulling the data from my gals into an easy spreadsheet. I could use this to import the stats into my analyzer. App grabs all soldiers from all bases, their names, missions, kills and current stats. 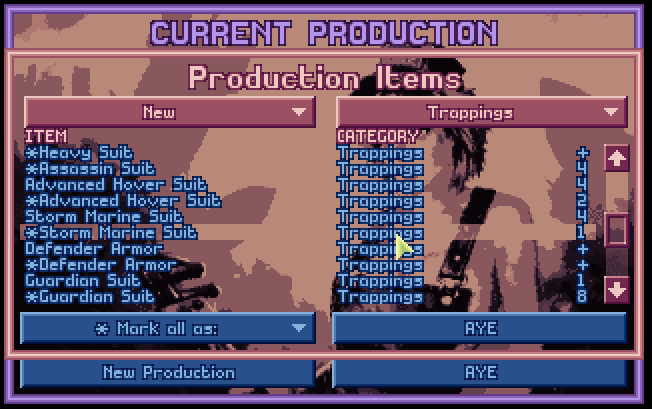 There are two buttons - one to open save files and one to save CSV files with soldiers stats. Those can be opened with almost any spreadsheet editor, including google docs. To install - run setup.exe from publish folder or try sde\bin\Release\sde.exe to run it without installation. Source code is included, so you may look at it and compile it yourself with Visual Studio 2013 Community Edition. I am sure there will be bugs, so contact me when you find one. Now on to the Squad analyzer. We need to be able to define the weapon attributes (power, damage type, TUs, modifiers, etc). Then we should have a sheet where the soldier's stats are matched against them allowing for analysis. Such things as average expected damage (before armor), and maybe even maximum damage per turn?? (i.e. are 6 swings with a machete better than 3 with a cutlass?, etc). Overall, I'm not convinced this is best format, but I'm putting it out here as a starting point. Spreadsheet gurus, data nerds, and creative thinkers are welcomed with open arms to this project! It didn't take me long to figure out that these missions could be brutal. Well, the supply ships anyway. One baby nuke in the face has made me avoid them for my entire first year already. So, I was curious. When do you think the supply ship farming becomes viable? What weapon tech/armor level would you feel is needed. Same with the Hideout. I'm too scared to try one out, but what do you find are the dangers, and how strong should you be before you brave them?? Provides an updated battlesprite of the original Juggernaut suit to bring it more in line with the Inventory image. battlesprites being used for the soldier. battlesprites. I started with recoloring the eye lenses to green. with some success though the side views are difficult to convey. At that point I decided to try it out in game, and its pretty good. before the mod's final incarnation. may need reworking after OXCE 3.0.
team on the OpenXcom forum for further great advice. Feel free to provide feedback, bug reports etc, here. Woot! Finally got it working!! Thanks Yankes!! Okay, all work has been completed on the new version of the mod compatible with new versions of the executable after changes made by Yankes in OXCE 3.1. Important: These mods will only work with OXCE+ 3.2 (v2016-07-20) or later. This mod creates alternate big objects and floor objects for quick visual identification on the battlefield of stunned, wounded, or dead units. Dead units are bloodied as normal, stunned display "ZZz"s and wounded dispaly "++"s.
Ok, the first working draft is ready for publishing. Drop in your user/mods folder and enable in settings. This mod came out of a very enjoyable campaign of Dioxine's X-PirateZ. Meridian's custom builds of Yankes' OXCE (OpenXcom Extended) inspired me to add a visual ID method of determining if an entity was stunned or dead. Meridian had added a terrific Fatal Wounds counter that quickly showed you how many wounds the entity had, but it still wasn't obvious at first glance if they were stunned or had expired. Brainstorming with Dioxine and Bloax in the xpiratez irc chat, brought up the idea that Yankes had implemented a feature that allowed for alternate sprites for unconscious units to be defined in the rulesets. This put the wheels in motion in my head of creating a second set of Corpse BigObs and I began the task of cleaning up bloodied corpses and bloodying up those that were already clean. Further collaboration hit upon the method of flipping the facing of these units too, (Dead face Right, Stunned to the Left because arbitrary, thats why). Once the graphics were done, they still needed to be converted to OpenXcom indexed palettes before final usage. Ruleset development followed, where I quickly borrowed the shell from Roxis' excellent alt armor mods, and then added in all 280+ corpse objects. Through the graphic editing process I had settled on going with only .png format. That caused a few issues when I first tested, as .gif images previously defined in the PirateZ master mod, did not display correctly if they carried the same number as the master mod. This then required developing a new set of numbers for those images. I arbitrarily chose to put them in the 115,000 range. The New unconscious images were given to the 120,000 range. The good news is, we have a cool working mod. The bad news is, Yankes is going to entirely rework the alt-sprite function with a script functionality in 3.0 (so this will have to be re-written to stay relevant). Special thanks to Dioxine for all his original and franken-sprited art that I further Franken-sprited for this mod. Further thanks to Bloax and the gang in irc chat for feedback and tips, and for the team on the OpenXcom forum for further great advice. This mod provides a rapid way to identify if a body on the ground in inventory is either dead or stunned. Alt-Corpse Mod 0.2.99C.1 Patch - This fixes Revenant Armor crash, and replaces a few images that were malformed. This patch is compatible with Piratez .99C1. Alt-Corpse-Complete Mod 0.2.99.A.1.b - Adding in compatibility for new Armor: Heavy Kevlar (PIR_411). This is expected in the next release of XPiratez after .99A.1. Alt-Corpse-Complete Mod 0.2.99.A.1.a - Four bugfixes, one set of new sprites for upcoming armor. I'm only going to support the Complete Mod going forward as that is where I think the interest is. If others would like to have either the Floor or the Bigobs and not both, I'll consider updating them. More info on the changes is in this post. Alt-Corpse-Complete Mod 0.2.99A - Combined both Floor and Bigobs into one mod. Alt-Corpse-Big Mod 0.2.99A - New Bigobs created for all vanilla units and some that used the same sprites. Stunned and Wounded variants created and tested. Alt-Corpse-Floor Mod 0.1.99A - This mod is configured to use the scripting mechanics from OpenXcom Extended 3.1 to replace images according to unit states. This version creates Floor Object images that show whether the unit is stunned, wounded, or dead. Important: This will only work with OXCE+ 3.2 (v2016-07-20) or later. Versions prior to this require OXCE+ 2.9 or earlier. o.1.98e - This is newer than the one shipped with PirateZ 98e. It has the better ruleset, and the tester file is renamed so there should be no conflicts. 0.1c.98c - Updated to include entities in .98C (2 new Pirate Armors, 2 Church, 1 Trader, 1 Academy). 0.1b - Updated to include entities in .98B (3 new Pirate Armors, one new Humanist). 0.1 - Corpses for all .98 XPirateZ entities. Uses OXCE 2.9 altBigsprite coding that will be superseded. This should greatly increase site reliability! The site is currently being backed up. Within the next day or two, the plan is to move it to the new server and get it back online. There maybe an outage with the move (I'd guess at most a day or two). DNS caches may need to update, so some users may not get through immediately when it comes on line again. Taking a look at the profitability mechanics of Piratez has been pretty enlightening. I wanted to put down my findings here and see if other smarter people might be able to point out something I might have missed. Findings: Hang on to all Silver and Purple chips. One Silver can net you under $700k in just under 7 days. Purple chips over $65k every 31 hours. These are quite significant. The major key that I see is that the earnings compound through each level of production. Due to multiplication, one Silver chip fully processed, yields 5000 Red Chips (1X5X10X100). At $200 per Red, you have just turned one $5000 chip into $1,000,000 in under a week at minimum staffing. If you have run out of silvers, Purples can still yield 1000 of the reds in under two days for a sale of $200k. To check profitability, we'll have to make some minimal assumptions. First and foremost is the requirement of having a mint to do the work. Lets ignore the build cost of this facility (or any others) and just use the monthly maintenance costs ($40,000). The mint allows 10 runts to work inside it, so we will use this as a minimum staffing figure (10 runts X $5,000/mo = $50,000). Lets call these the "Overhead Costs" and they total $90,000. There are two other costs as well, the job cost for production and the cost of materials. Job costs are: Silver>$1500, Purple> $2500, Blue>$4000. Multiplying these against the number of items to process (S:1, P:5, B:50) yields a total job cost $214,000. Materials cost can be considered the face value of the chips. In considering the production of just one silver chip, we are looking at an additional material cost of only $5000. I believe this is a fair way of looking at it, though arguments could be made to consider the face value of all the intermediate chips that are processed as additional opportunity costs (an additional $70k as it turns out). I'll go with the simpler version. Our profit on one silver is Sale Price - Total cost. Not bad for a week's work, so hang onto those silvers! Just over four lots of Silvers can be processed in a month for a profit of $2,764,000.00. This makes the hourly profit on these guys $440/hour. Very tidy. If you are out of silver, you can process four lots of purples for $1,552,500.00 at an hourly rate of $219/hour. Of course, add in additional runts from workshops or factories and the speed can increase significantly. The major limiting factor in this operation is the supply of chips, which must be gathered from tactical missions and acquiring the research breakthroughs and building the infrastructure necessary for these enterprises. Edit: (4/12/2016) : Limiting factors have been lifted a bit with the new Robbery Mechanics yielding a good supply of chips as well as Pimping which also provides chips. Looks like our mints may be able to run longer than before with these new additions to the mod. This discussion uses values from the .97C version. X-com soldiers can fall conscious and die due to fatal wounds. (So can enemies if you enable the option). Currently, the only way to know if they are bleeding is by standing over them trying to use a medikit. Wouldn't it be nice to check them even if you didn't have a medikit and know whether or not they needed aid? How about putting a simple "Bleeding" icon that could be represented by a red tear drop overlaid on the Corpse Big Object. That way you could use the inventory screen when standing over a fallen unit and tell not only if they are dead or unconcious, but also if they are fatally wounded. Forgive me if this has already been brought up and discussed/dismissed. I didn't find it when I searched suggestions.